Last week, I had a big, beautiful cauliflower sitting in my fridge, who just know she was destined for greatness. And as it turns out, she wasn't just an empty dreamer. Greatness, indeed. The concept of the cauliflower pizza crust was spreading like wildfire throughout Pinterest a couple of weeks ago, which proved to be excellent timing for the beauty in the crisper drawer. Pinterest is now home to several links to different versions of this veggie pizza crust, and with good reason. It happens to be an amazingly good-tasting, solid solution for people who are vegetarian, gluten-free, low-carb, or just trying to eat more veggies. All of the reviews I read for all of the different versions of the recipe said more or less the same thing: It's delicious! 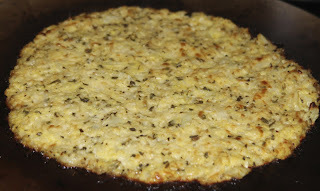 It doesn't taste exactly like a pizza crust, but it doesn't taste like cauliflower, either. And it needs to be eaten with a fork. Although I agree with all of these opinions, my kids took umbrage with the last one. It can't be pizza if you need a fork. And so, they went ahead and picked it up and ate from the tip to the crust. Then, they licked their fingers and asked for more. (I'm with my kids on this one... it isn't a dry crust, but it is perfectly lift-able, and I see no reason why those inclined to lift shouldn't). It's really quite easy to make. Some of the recipes I saw said to steam the cauliflower first, then rice it. I found it easier to run it through my food processor first, and then cook it. The cauliflower doesn't need any additional water to cook, so just put it all in a glass bowl and microwave it. 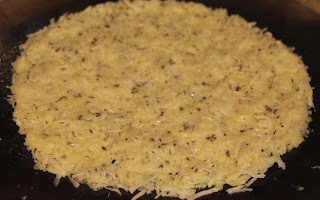 After that, stir it with some "glue" ingredients, bake it, top it, and melt the cheese. Then sit back and enjoy perfectly guilt-free pizza. 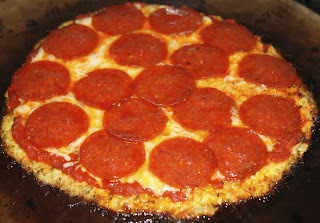 (Well, guilt-free until you add pepperoni. I would have preferred some veggies, but I was determined to get the kids to eat it this first time. We can always go up from here). Most recipes I saw, on various blogs, traced back to Your Lighter Side as the originator of the concept. In a food processor, finely chop the cauliflower. (Use the shredding blade). You can also hand-shred this, if you want to be industrious and work out your forearms. In a large bowl, cook in the microwave on high for 8-9 minutes. It should be soft, not mushy. 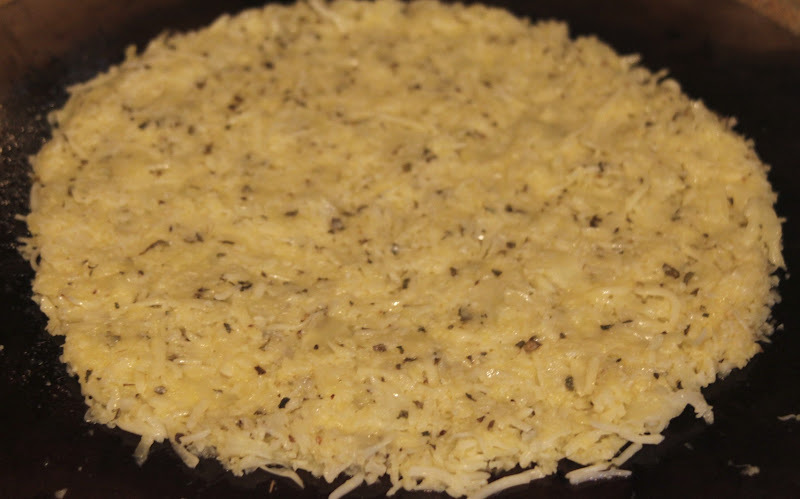 Stir together the cooked cauliflower, cheese, egg, and seasonings. 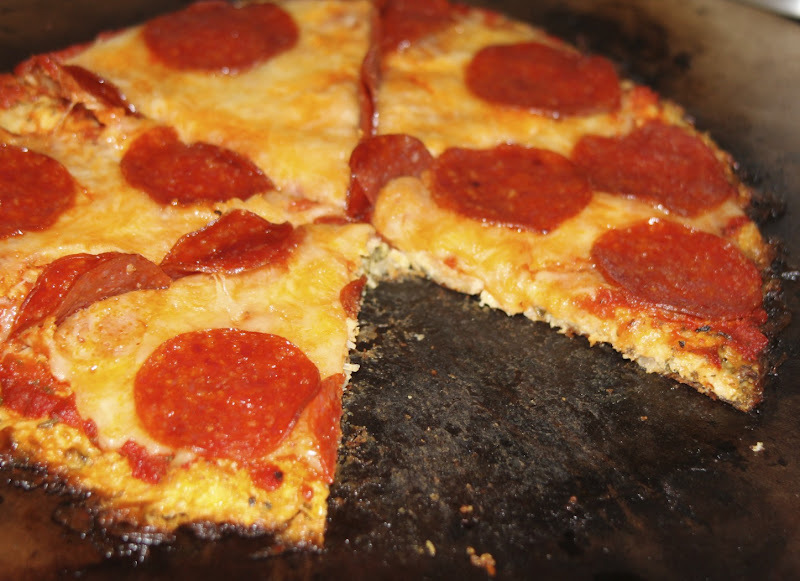 Shape it into a disk on an oiled (or non-stick) pizza pan. Bake it for about 15 minutes, until golden brown. After the crust is done, go ahead and top it any way you like. I did traditional sauce, mozzarella, and pepperoni. Pop it back in the oven for another few minutes, to melt the cheese.